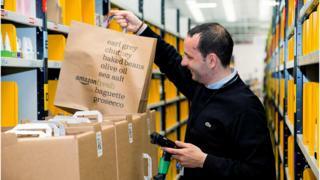 Amazon is launching a full online supermarket service in the UK. From Thursday, Amazon Prime customers in central and east London will be able to order a full weekly shop and get it delivered the same day. It plans to roll the deliveries out further across the UK, but has not set a specific date. "We are launching with a comprehensive offer in a limited area and will take our time to hone our service," said Ajay Kavan from AmazonFresh. That service has been running in the US since 2007. Can Amazon win over grocery customers? Amazon UK has so far sold only a very limited amount of fresh food through its Prime Now service. It also sells long-life products such as cereals, pasta and nappies. According to retail expert Bryan Roberts, from TCC Global, although Thursday's launch is limited to 69 postcodes in London, it will be the last thing the big four grocers - and Ocado - wanted to hear. "While there is no cast-iron guarantee of success... I'm tempted to believe that we'll look back on today as something of a disruptive game-changer up there with the entry of Aldi and Lidl," he said. Amazon recently did a deal with Morrisons, making hundreds of products available through its website. This is now being increased and food from other suppliers will also be on offer. It means that customers will be able to shop from 130,000 products, including fresh fruit and vegetables, at prices which Amazon claims will be more competitive than the main grocers. It will also offer specialty food from 50 local suppliers. "Convenience, ultra-competitive pricing and customer service will find favour with urban shoppers and will heap immediate pressure on retailers that do sizeable business in the capital. The model is scalable and the popularity of the Amazon Prime ecosystem around the UK will mean that it will find a receptive audience," said Mr Roberts. Amazon has built a behemoth around easy, one-stop shopping. Food is one of its final frontiers and unlike the established players, it does not seem too concerned about profits, in the short term at least. Its focus will be building market share. "The market has been waiting for the arrival of AmazonFresh for a very long time. There has been endless speculation about what it might entail," said Adam Leyland, editor of the Grocer magazine. The service will not be free. You have to be a member of Amazon Prime as well as pay a flat fee of £6.99 a month. "In a well established online grocery market like the UK, that's a lot more realistic than the US proposition, with its annual sign-on fee of several hundred dollars," added Mr Leyland. Amazon: Is fast delivery a fresh enough idea to tempt customers?